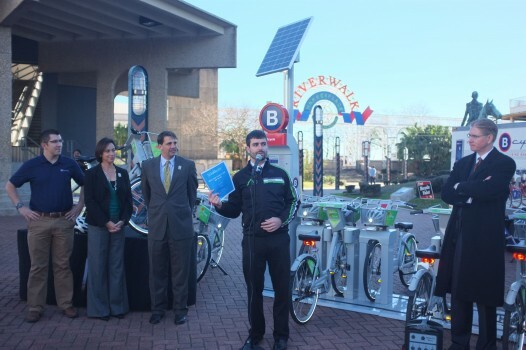 Recently I was able to catch up with J.J. Smith and Jamie Wine, Bicycle Valet Coordinator for and Executive Director of Bike Easy respectively, about the ongoing Bike Valet and B-Cycle Bike Share Demonstration located front and center for the Super Bowl festivities in and around the Riverwalk Spanish Plaza, the Riverwalk Market Place and the Morial Convention Center this week through the weekend. We covered many topics, ranging from how each got involved with Bike Easy and how far the organization has come in the last few years to how the programs got hooked up with the Super Bowl, the significance of each, and specifics for the weekend. In “Part One” of each interview, J.J. and Jamie gave us information related to the latter aspects of the programs as listed above including the specific locations of each B-Cylcle kiosk and Bicycle Valet shown on Bike Easy’s Event Map. Below is “Part Two” of the interviews, containing excerpts related to the former subjects – some of the history and hard work leading to these events — as well as photos from yesterday’s Bike Share Media Demonstration. M.T. : All right, a little bit about you now. Are you originally from New Orleans? J.J.: I grew up in Montana and I moved here right after Katrina, when I was 19. It was just where I wanted to be. The rest is history. M.T. 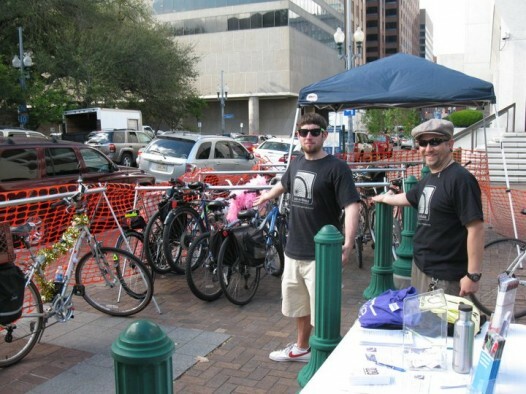 : How did you get involved specifically with Bike Easy and, in turn, with the Bike Valet? Are you responsible for creating Bike Valet? J.J.: I did not create Bike Valet. But, I’ve been there from the start. Bike Valet is actually how I got involved with Bike Easy. First, I’d been commuting by bike for a while. On a whim I just said I’d like to do that. I get off work at this time. I can be there at this time. I showed up and it was so rag tag! It was a tent with orange construction webbing around it. M.T. : Yeah, I’ve seen some photos. J.J.: Yeah, the first was one was like … we did not know what we were doing! I was just kind of like, what is going on here?? This doesn’t make any sense. But, despite how weird it was, I had a great time. So, I started coming every week. …almost two years ago now. This would have been in the spring of 2011. M.T. : Was that when Bike Valet really started? J.J.: Yeah. It was when we had our first Bike Valet. M.T. : And now, at the Oak Street Po-Boy Festival, there were hundreds of bikes there. Far from rag tag at this point? J.J.: Yeah, we’ve learned a lot. And, like I said, I’ve been there from the start. So, I’ve kind of put my mark on our system and we’ve done some great events. We’ve done Blues and BBQ two years in a row. We‘ve done the Oak Street Po-Boy Festival two years in a row. It is our biggest event as far as the number of bikes parked. We’ve parked about 500 bikes. We’ve done Freret St. Festival and we have that coming up again this Spring. I don’t want to leave anybody out. Oh yeah, we did the Running of the Bulls this summer. Another great event we did was Jazz in the Park at Armstrong Park. We did that for Armstrong Park’s weekly music festival this fall. M.T. 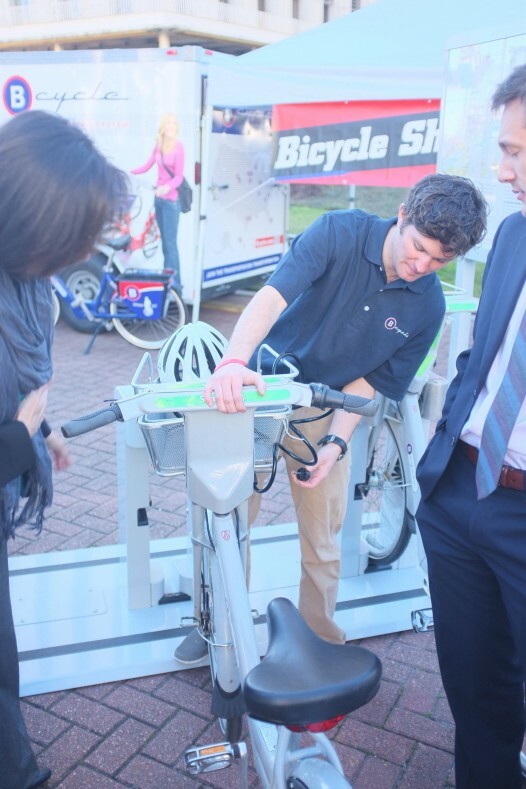 : I heard a lot of great things about that personally – about the Bike Valet being there. J.J.: Yeah, that was awesome. Loved that. M.T. : Do y’all get good feedback and is it growing? The Super Bowl obviously seems like a nice little feather in your cap. J.J.: Yeah, it’s definitely growing. We do get good feedback. We get so much good feedback from the users. The events are getting good feedback from the actual participants: people who ride their bikes up and park with us. That alone is a huge positive for an event organizer, because they’ve just worked to bring a service there that really pleased the people they’re trying to please. The people who are coming to the event enjoy it that much more. And, also, it’s great for an event because it tidies things up. You don’t have people locking up this many bikes in the event area or all around it. Which makes the neighbors happy as well, because there’s not this giant influx of bicycles locked right in front for their house, their fence, or to their porch railing. M.T. : And, at the end of the day, it’s a lot safer for all the bikes? J.J.: It is. Yes. It’s safer for all the bikes and it’s good because it’s so easy for people to use. That somebody who might just want to walk their bike into an event to check it out, they can just drop their bike off with us and they can in for 10 minutes. It takes them 90 seconds. M.T. : And, that’s the big message, isn’t it? M.T. : So, you came from Seattle. 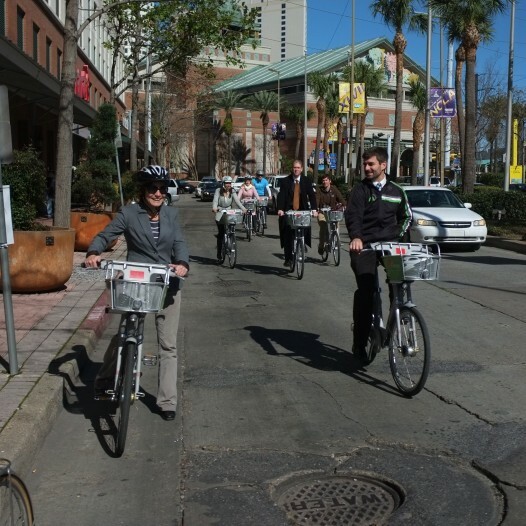 How did you end up in New Orleans working with Bike Easy? J.W. : I moved here in 2010 to be the Executive Director of Bike Easy. I left a program in Seattle where I was managing an education program for advocates of the environment. I was educating people how to be good advocates for the environment in the state of Washington. The skills you learn doing that in a non-profit setting are very similar to advocating for a non-profit for bikes at a regional level. So, it translated really well. M.T. : Ok. So, you’ve been working with Bike Easy for the last couple years? M.T. : It seems as if Bike Easy’s come a long way since then. To be at this point where we’re on the cusp? Are we on the cusp? 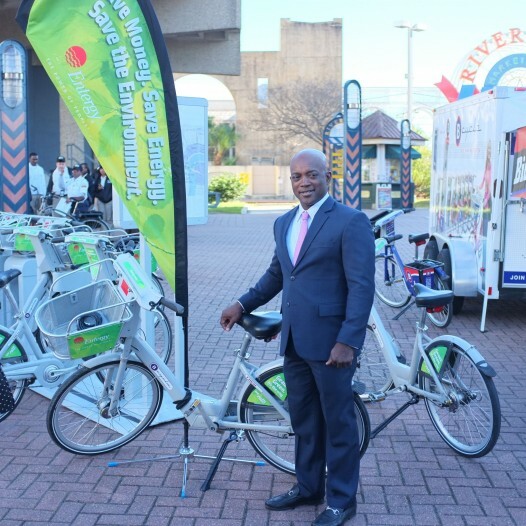 Does this mean we’re on the cusp of getting bike share in New Orleans? When I got here I was very fortunate to have the good work of the board behind me. There was a very strong board the two years prior to me being hired that did a lot of fundraising, a lot of advocacy work. I am also riding the wave since the storm (Katrina) of people riding bikes. After the storm, that was the only way they could get around — by bikes. A lot of the volunteers that came into the city to work on rebuilding houses were riding bikes. Suddenly there was more of a bike culture. Which is a big deal. The culture is already developed. Whereas in a lot of cities the advocates have to spend a lot of time building the culture. So I was really lucky when I got here to start riding that wave. Bike share is just the next big thing. We’ve already got lots of really great bicycle infrastructure in place where you could ride a bike share bike. That’s a key component. Before you install a system you have to have somewhere to ride them. J.W. : So we already have that prerequisite. And what happened was, about a year ago the University of New Orleans wanted to fund a study to see if it was feasible. So, Bike Easy was paid by UNO to look at how they did it in other cities — in Europe and around the country. So, we got the Downtown Development District. We’ve got Harrah’s Casino through Kristen Palmer’s office, the New Orleans Convention and Visitor’s Bureau, the New Orleans Tourism Marketing Corporation. They all realize that bike share is the way to go. Which is really important. The feasibility wasn’t just about the nuts and bolts of how to do it. But then how do you fund it? Having those funders come on board for the study was a huge step in actually getting a bike share system. M.T. : So, how does bike share improve a city’s bicycling infrastructure and is it the same as “bike rental”? How does it work exactly? J.W. : So bike share is a system of temporary bicycle borrowing. It’s not really “bike rental.” And, what you do, it’s designed for short trips. One to three miles. You check out a bike and check in a bike usually within 30 minutes. You check it out from where you’re leaving from. You check it back in at your destination. “Bike rental” is getting a bike for an entire day and exploring a city or for a couple hours. It’s really not designed for that. Although you can explore a little bit when you’re in bike share, bike share is about augmenting the transportation system so it’s more resilient. It’s about helping people access economic opportunities through bicycling. So they’re getting their health taken care of. They’re accessing shopping. They’re going to school. They’re going to work. Bike share is a way to get more people on bikes who don’t necessarily own bikes. And by doing that, you actually make it biking safer for everybody. Because the more people that are on bikes, it’s statistically proven that it’s a safer to ride a bike. So this is going to help people who don’t even use the system who happen to be on bicycles. M.T. : It’s almost a form of public transportation then? J.W. : It absolutely is a form of public transportation. And that’s how it should be viewed. It should not be viewed as a for-profit, private venture. It’s part of the public transportation system. M.T. 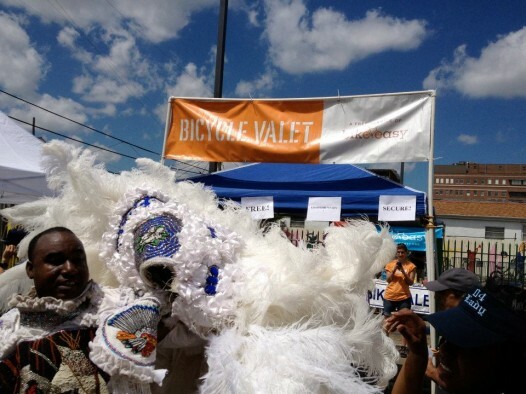 hinson covers the cycling community in New Orleans for NolaVie.